(TibetanReview.net, Nov07, 2016) – Having vowed to “make due responses” after President Andrej Kiska met with Tibet’s visiting exiled spiritual leader, the Dalai Lama, over lunch on Oct 16, China has on Nov 5 cancelled a top-level bilateral meeting with Slovak Prime Minister Robert Fico, reported the AFP Nov 6, citing the local SITA newswire. The report said Chinese Prime Minister Li Keqiang was scheduled to hold a bilateral meeting with Fico, who is also steering Slovakia’s six-month rotating presidency of the European Union until the end of December. The meeting was to take place on the sidelines of the Fifth Meeting of Heads of Government of Central and Eastern European Countries (CEEC) and China (described as 16+1) in Lativa’s capital Riga. “The Chinese side cancelled the bilateral meeting with Slovak Prime Minister Robert Fico, scheduled ahead of today’s summit,” the Slovak government was quoted as saying by the local SITA newswire without any explanation. Li was reported to have met with 16 counterparts from across central and eastern Europe on Nov 5 for talks focused mainly on developing trade. Leftist Fico was reported to have moved quickly to mend fences with Beijing, telling reporters that he had invited the Chinese Prime Minister to visit Slovakia. Despite the cancellation of the bilateral meeting, the two sides did seem to have had an exchange of views. China’s official Xinhua news agency reported Nov 7 that during his conversation with Slovakian Prime Minister Fico, Li said the two sides should respect each other’ s core interest and major concerns, meet each other half way and promote the development of bilateral ties in a healthy and stable manner. And Fico was reported to have responded in kind by saying his government attached great importance to the development of bilateral ties, reaffirming its fixed adherence to the one-China policy. He has added that Slovakia stood ready to make joint efforts with China to enhance the development of bilateral ties along the right direction with a healthy manner. 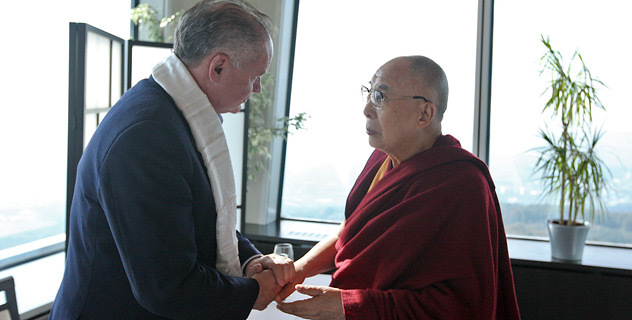 President Kiska is a millionaire businessman and philanthropist who turned liberal politician; his meeting with the Tibetan spiritual leader was described as private. China, nevertheless, criticized Kiska for ignoring its “strong opposition” to the move, which it claimed undermined Slovakia’s promise to support the “one-China” policy. AFP cited Slovak Economy Ministry as saying bilateral trade between eurozone member Slovakia and China tallied at more than six billion euros ($6.7 billion) in annual turnover last year. China enjoys huge trade surplus with most of its trading partners due to its highly protectionist policies, although it was not stated what the position was with regard to Slovakia.